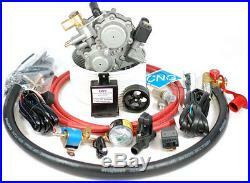 LP Conversion Kit for 4 or 6 Cylinder Carburetor Engines up to 3.5 Liters. Model LPC4 Comes with a Standard Regulator. Our carburetor kit converts your engine to a fuel injected engine while operating on LP. Please completely read all the information below before ordering. How is the LP kit different from a CNG kit? The LP kit requires the use of an LP tank that is DOT approved. The tank is filled from LP filling stations using an LP filling nozzle. The LP kit comes with an LP regulator and uses the same tubing to connect from the regulator to the tank. An adapter fitting to connect to an LP tank is included. There is no filling nozzle pressure gauge or level sensor supplied with LP conversion kits. Everything else is the same. We will need the following information about your vehicle when ordering a conversion kit: 1. Fill Nozzle Type Read Fill Nozzle Options section below. Mixer Size See the information below for more information on selecting the mixer size. Engine Size in Liters 8. Comments Leave any additional information or comments you may have. Some engines that may require special parts from us or after market parts. Engines with duel carburetors will require our dual mixer kit. The duel mixer kit comes with an additional mixer, a tee fitting, 18 of additional hose, and 4 additional hose clamps. Most carburetor engines will need a single port carburetor adapter or a cold air intake kit. These kits include 3" or 4" round tubing, couplers, clamps and a cone shaped air filter. The air intake system will allow you to install the mixer in or to the round intake tube. If installing the mixer with hose couplers, order the mixer the same size as the tubing. We recommend installing or at least ordering the air intake system before ordering the CNG conversion kit so you know what size mier you will need. These parts are available at your local auto parts store or online. See the Spectre brand at most auto parts stores. Fill Nozzle Options We have two fill nozzle options. Standard fill nozzle with 1/4 turn shutoff valve with 2 ports so it can be installed in-line from the cylinder to the regulator. This is what you should order unless you need one of the other options. Strait nozzle without shutoff valve. For installing in tight or hard to get to locations. Comes with an extra 1/2 length roll of tubing. It is connected directly to the tank valve. The regulator is connected directly to the other port of the tank valve. Stainless Steel Fittings Option For a small additional cost we can supply 1/4" or 3/8" stainless steel fittings so you can install stainless steel tubing instead of the steel tubing that comes with our kits. We do not supply the stainless steel tubing. We recommend our steel tubing as it is lower in cost and much easier to install. Call to order if desired. How the Carburetor Conversion Kit Works A mixer (venturi) is installed in the air intake between the air filter and the carburetor which provides single point fuel injection. If your air filter is mounted over the carburetor you will need to order a carburetor adapter to convert to a 3" or 4" round tube to mount the mixer in or to. You will also need and a cone shaped air filter, tubing coupling, and perhaps other parts, or a complete intake kit designed for your vehicle. An oxygen sensor installed on the engine's exhaust is monitored by the CNG controller which controls an electronic valve (stepper motor) installed on the low pressure CNG fuel hose going to the air intake to provide the proper fuel ratio at all times. On all gasoline engines the combustion air has always been controlled with a throttle plate so it makes sense to bring the fuel in with the air letting the oxygen sensor that comes with the kit adjust the fuel ratio. This provides the best mixing of the gas and air which provides excellent engine performance. The engine idles and runs the same as it does on gasoline. The timing is advanced for the best operation on both fuels by rotating the distributor. The 3 way switch on the dash allows you to convert to either fuel. When converting to CNG you place the switch in the neutral position which shuts off the gasoline to the carburetor with the provided solenoid installed on the gasoline fuel line. When the gasoline begins to run out the switch is changed to the CNG mode. The instructions are written for the car owner to install with many tips, "how to" information and a trouble guide. A computer cable comes with the kit and programming is simple and takes only a few minutes. The software is downloaded from our web site. Our controller features self adjusting electronics which always provides peak performance. The control on the dash indicates which fuel you are using and how much CNG is in your CNG tank. This kit allows you to run on either gasoline or CNG with the push of a button on the dash. If you run out of CNG you will begin to loose power so you just push the button on the dash and you will switch to gasoline and continue driving. You should always refuel before you run out of either fuel. See our web site for more information. All of our kits have a control on the dash which indicates which fuel you are using and how much CNG is in your tank. All of our kits allow you to run on either gasoline or CNG with the push of a button on the dash. All of our kits come with regulators designed for your engine size for more power and better performance. Our Millennium kit will automatically switch to gasoline if you run out of CNG. Some of our parts are imported from other countries. Some parts are built in the USA. We have chosen the best parts with the best prices to provide the best kits available at the best price. All our kits are rated for 3,600 psi and come complete with everything you need including the filling nozzle. You can use any type of legal DOT certified CNG tanks with our kits. More Information about our CNG and LP Conversion Kits Mixer Kits Mixer kits are known as mixer, aspirated, fogger, single point injection, or air intake conversion kits. We have mixer kits for all engines including fuel injected, carburetor, and diesel. These kits are the easiest to install and adjust and are the lowest cost. Compressed Natural Gas (CNG) is one of the lowest cost and environment friendly alternative fuels available. More than 12 million cars in the world are driving on CNG. All you need is a CNG Conversion Kit, a CNG Tank with Valve and a Mounting Bracket for the Tank. You can use multiple tanks for a longer driving range with any of our conversion kits. 88 a GGE (Gasoline Gallon Equivalent). If your car gets 30 mpg on gasoline you will still get the same 30 mpg on CNG and at a lower cost. That is like going from 30 mpg to 90 mpg if you are spending 1/3 the cost for CNG. In many areas the cost of natural gas is regulated, keeping the price low. Domestic Fuel - Not dependent on foreign oil and their constant price increases. You will save even more in the future as gasoline continues to rise faster than natural gas. Environmentally Friendly - Fewer emissions as hydrocarbons are virtually eliminated. Engine Runs Cleaner and Lasts Longer - No Carbon Deposits Which Create Friction and Engine Wear. Ignition (Spark) Plugs Stay Cleaner and Last Longer - No carbon deposits to clog and dirty the plugs. Bi-Fuel - Change to either fuel with the push of a button. DISADVANTAGES Reduced Performance - With our conversion kits for gasoline engines performance is reduced by approximately 10 to 20% as natural gas has different physical attributes, and your engine was designed to run on gasoline. The mixer also restricts air flow. Storage Space for Storage Tank - The CNG tank will need to be installed in the trunk of most cars, in the truck bed of most trucks, or behind the back seat of an SUV or van. Sometimes smaller 11 diameter tanks can be installed underneath some vehicles. Filling Station Availability - Some areas of the United States have few or no filling Stations. When gasoline prices are high our prices may go up and we may run out of stock as demand is very high. New Price Matching We will match the price of any USA stocking competitors advertised price on any comparable CNG kits, parts or tanks. Why we recommend our mixer kits for do it yourself and for experienced installers. Our mixer kits are easy to install and adjust. They are lower in cost. They use the oxygen sensor to adjust the fuel ratio so the engine runs with the same fuel ratio and exhaust temperatures eliminating any engine or any other damage to your vehicle. You do not have to wait for the engine to warm before you can run on CNG. Mixer kits run on CNG immediately. They run well in all weather conditions. Our mixer kits are easy to install and program. Address: 1604 West Hill Field Road Suite 102, Layton, Utah 84041. The item "LP Propane Conversion Kit for 4 to 6 Cylinder Carburetor Engines Model LPC4" is in sale since Tuesday, January 15, 2013. This item is in the category "eBay Motors\Parts & Accessories\Car & Truck Parts\Other Parts". The seller is "grimhallvehicleupfitters" and is located in Layton, Utah. This item can be shipped to United States, Canada, United Kingdom, Denmark, Romania, Slovakia, Bulgaria, Czech republic, Finland, Hungary, Latvia, Lithuania, Malta, Estonia, Australia, Greece, Portugal, Cyprus, Slovenia, Japan, Sweden, South Korea, Indonesia, Taiwan, South africa, Thailand, Belgium, France, Hong Kong, Ireland, Netherlands, Poland, Spain, Italy, Germany, Austria, Israel, Mexico, New Zealand, Philippines, Singapore, Switzerland, Norway, Saudi arabia, Ukraine, United arab emirates, Qatar, Kuwait, Bahrain, Croatia, Brazil, Chile, Colombia, Costa rica, Panama, Trinidad and tobago, Guatemala, Honduras, Jamaica, Malaysia, Bahamas, Viet nam.